Strawberry vodka and a sparkling blush wine shine in a fun and fruity cocktail. You will also find a few surprises inside the Sparkling Strawberry Rosé Cocktail. It's a delightful pink drink that you'll definitely want to share with friends. To complement the wine and vodka, a hint of pear and a touch of basil are added. The wine gives it a nice, light effervescence and the other ingredients ensure that your taste buds won't be bored. There are two DIY ingredients in this recipe. The basil syrup is very easy to make at home and should be ready in under an hour. If you choose to make your own strawberry vodka, you will have to plan ahead because it can take up to two weeks to get the perfect flavor. However, in a pinch, you can pick up strawberry vodka at many liquor stores. Have fun with the Strawberry Rosé Cocktail. While the recipe's written for a single glass, it's incredibly easy to make enough for an intimate brunch or a large party. Pour the vodka, nectar, lemon, and syrup into a wine glass filled with ice. Garnish with a basil leaf and strawberry or your choice of seasonal fruits. A number of companies produce strawberry-flavored vodka and that is the easiest option for this cocktail. Among the favorites are Three Olives, Stoli, and Smirnoff, though you'll find a few other vodka brands that offer this flavor as well. If you're feeling crafty and have some fresh strawberries to use up, consider making your own. It's quite easy and tastes great, you'll just need to allow a week or two for the infusion to be ready. The same technique can be used with a blanco tequila or white rum for other drinks. Strawberry vodka is just like any other vodka infusion and can be done with vodka and fresh strawberries alone. However, many people have found that adding a little sweetener helps with this particular flavor. This method includes simple syrup as an option, though you could toss in a tablespoon or two of sugar as well. To make strawberry-infused vodka: Wash and remove the stems of about 1 1/2 cups strawberries. Cut into two or three large slices per berry. Add to a wide-mouthed infusion jar and fill with vodka. If you like, add 2 tablespoons simple syrup. Shake well and store in a cool, dark place. Give the infusion a good shake once or twice a day. Do a taste test after five days and continue the infusion until it reaches your ideal flavor. Once done, strain out the strawberries and bottle with a tight-sealing lid (the original vodka bottle works great). Tip: A 1-quart mason jar will fit a full 750ml (25-ounce) bottle of vodka. The jar holds 32 ounces, so this extra space should be a perfect allowance for the berries. The basil simple syrup is incredibly easy to make. It uses the same process as any other herb-infused syrup. This is a great addition to a variety of cocktails including the Tomojito and can replace the syrup and basil found in the Basilica. To make basil simple syrup: Add equal parts sugar and water (1 cup each is a good batch) to a saucepan and bring to a boil while stirring to dissolve the sugar. Add about 1/2 cup rinsed basil leaves, cover, and simmer for about 15 minutes. Remove from heat, keep covered, and allow it to infuse and cool (about an hour). Once cool, strain out the basil and bottle in a glass jar. The basil syrup should be stored in the refrigerator and will be good for about three weeks. Sparkling rosé wine is relatively easy to find and many cost $15 or less. If you happen to have the still version of this pink wine in stock, feel free to use it. To bring that sparkle back into the Strawberry Rosé Cocktail, add a splash of club soda or mineral water. 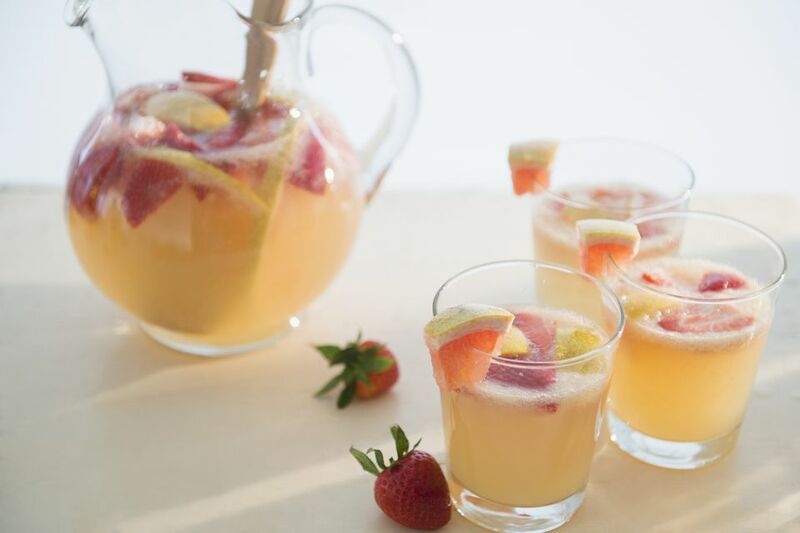 This cocktail would make a fabulous punch or pitcher drink and it can be adapted to any size of party you might be hosting. Remember that if you're making your own vodka, you will have to plan at least a week (if not two) ahead. The single cocktail makes a 5 1/2 ounce drink. You simply need to multiply it to create as many servings as you need. The easiest way to do so is to break the recipe down into parts: 1 part vodka, 1/2 part pear, 1/3 part syrup and juice, 1 1/3 part wine. For instance, you might pour 1 cup vodka, 1/2 cup pear nectar, 1/3 cup each syrup and juice, and 1 1/3 cup wine. This would create almost 28 ounces or about seven 4-ounce drinks. How Strong Is the Strawberry Rosé Cocktail? The Strawberry Rosé Cocktail is a gentle little drink. Even with the vodka, it's not much stronger than some of the heftier wines. While the alcohol content will vary with rosé, we can use a 12 percent ABV wine as an example to estimate this cocktail's strength. It comes out to be around 15 percent ABV (30 proof).